As part of our ongoing collaboration with those involved in marine energy, both in Denmark and in Orkney islands, we developed a ‘fanzine’–a fan magazine, inspired by the cut-and-paste interventions during the 1970s. 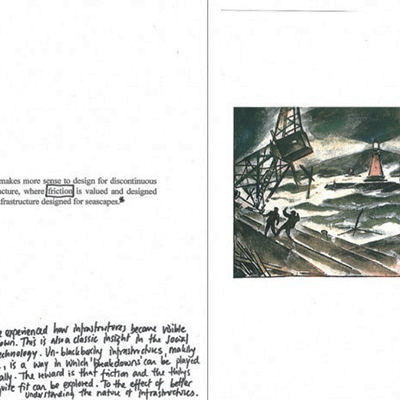 This handcrafted booklet was composed during a workshop by the Alien Energy research team and many of those we are working with in the marine energy industry. A fanzine (fan magazine) is often an intervention into existing, dominant understandings; it takes existing material and reformats and repurposes it. We used this paper-based format to explore and experiment with how Science Studies and anthropology approaches could form a dialogue with the marine energy industry and its imaginaries – what might move back and forth?